Here are our top magical Christmas activities for kids which make the festive season so memorable. There are so many games and crafts to choose from, you'll have trouble fitting Santa in! The build up to Christmas and the Day itself offer the perfect excuse to sneak in lots of learning opportunities. It's also just the time to try out lots of homeschooling craft activities and games. 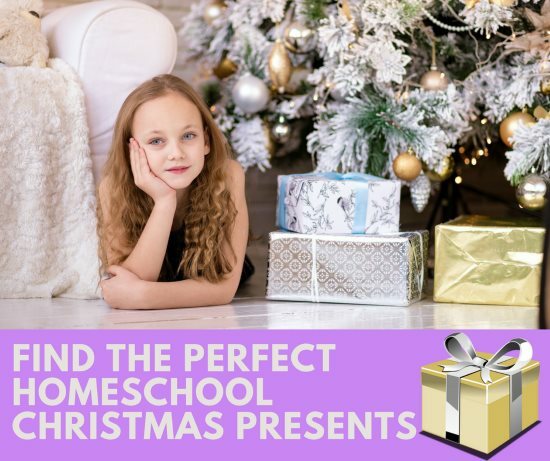 The choice is overwhelming, so I'm going to pick out a few of our homeschooling favorites to give you a flavor. You can also find magical gifts which are both fun and educational. 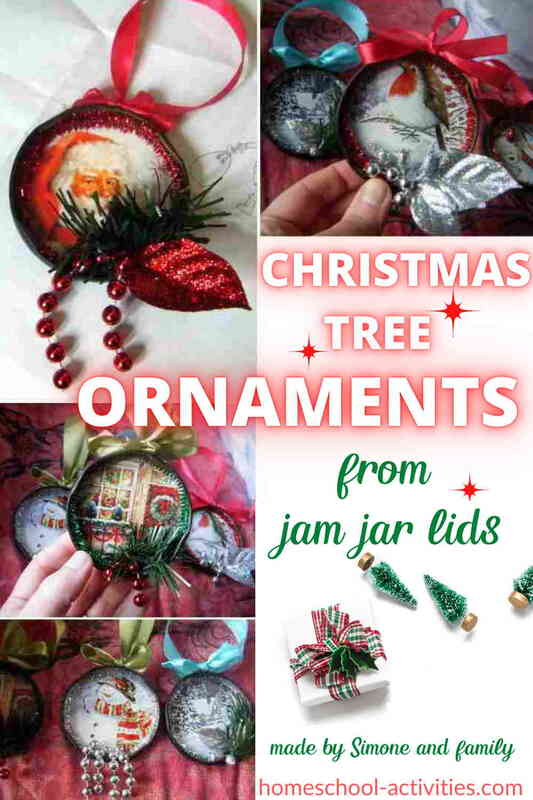 These wonderful Xmas tree ornaments are made by Simone from my Courageous Facebook Group. Put a ribbon and a message on the back if you like. This is the time to get together a treasure chest of craft materials. Kids activities and games always look so much better if you have top quality homeschool materials to hand. You don't have to do too much more for anything your child makes to look great! 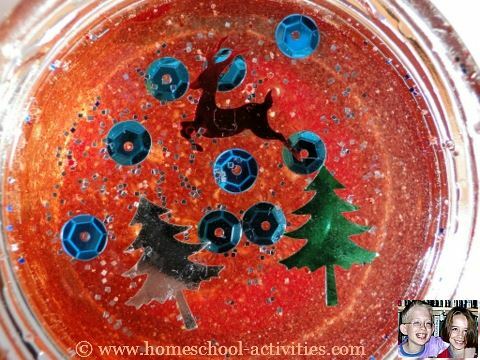 Snowflakes make fantastic homeschool Christmas activities for kids. There are lots of ways to make them look good. A simple way is to draw a snowflake with glitter glue. They look good on transparent acetate, but cardstock would do fine. Make a circle of tissue paper, fold into three and cut small pieces out of the edges. So long as you don't cut through the folds (! 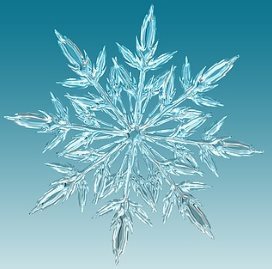 ), your kids will open them up to reveal a beautiful homeschool snowflake. Whatever your kids turn out, I am certain that whoever gets them will be infinitely more pleased than with the best shop-bought version. 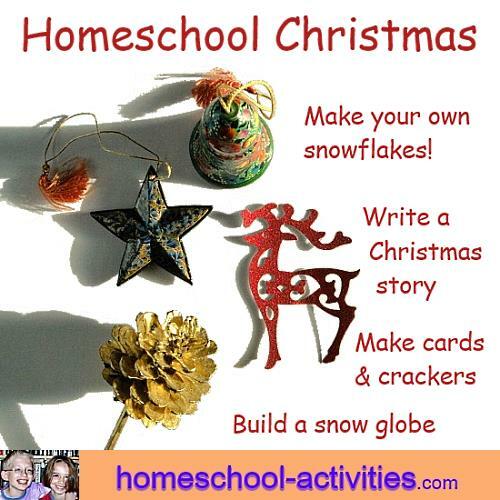 They also make fabulous homeschooling Christmas activities for kids. Trees look less wobbly if you fold a piece of green card in half, draw half a tree and cut round the edge to open out a symmetrical version. Decorate your homeschool tree with pompoms, glitter glue and sparkly pipe cleaners. Hang presents and lights from the branches. Beads, sequins and buttons all work. When it comes to decorating your real tree, you can use our homeschooling salt dough recipe for fun easy activities for kids making your own tree ornaments. 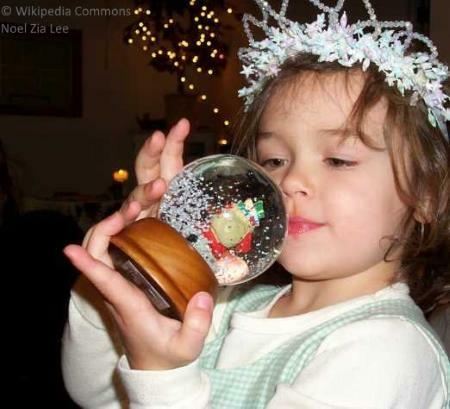 Put Santa and a Snowman together with snow to make a magical Snow Globe scene in winter crafts for kids. Another fun kids activity in the build up to the Day would be to use our free kids writing worksheets to write about your best Christmas present. One look at the trees and reindeer reminds you that the festive period is the perfect time to add a few science experiments into your Christmas activities for kids! See what happens to the tree when you add it into a lava lamp! Add glue and sprinkle with salt to make snow-laden branches. Make a homeschooling tree pot to stand them in using a juice lid. Spray with gold or silver paint (fabulous). Use glitter glue and sequins. Hang from your homeschooling tree by gluing on string loops. 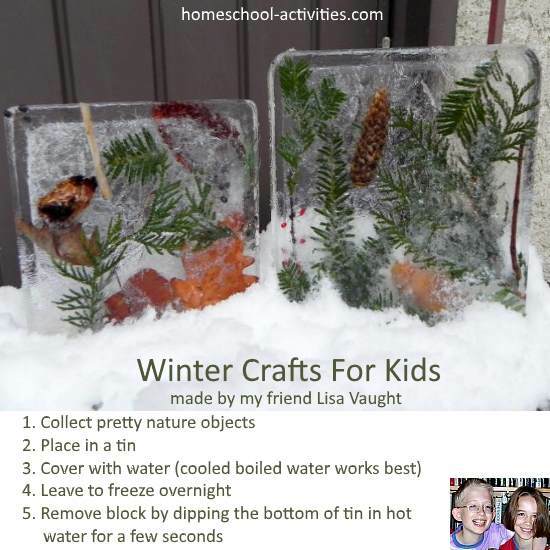 This takes a little effort, but it's one of those homeschooling Christmas activities for kids that rewards in many ways. It's great to do and adds to the fun and games of the day itself. I have to say I cheat. I buy a pre-made cracker kit. It comes complete with a snap (which makes the bang), hats and a shiny foil case. You could certainly make homeschooling ones yourself, though maybe your crackers would have to be the silent version. Choosing small gifts to go inside. Sometimes we make them. Whatever your kids hide inside, they've got to be better than the standard key rings and whistles. 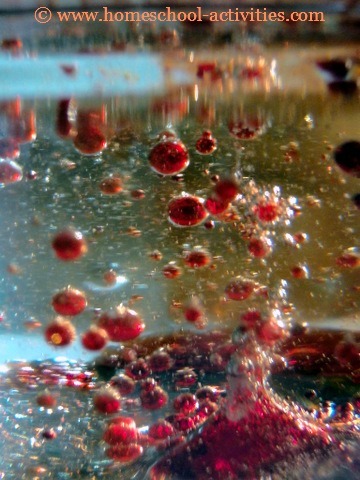 One of those party poppers is good fun. Decorate the outside of your homeschool cracker. Add glitter and a shiny gift tag. 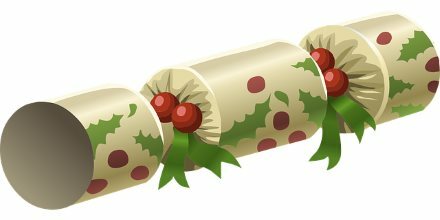 Christmas crackers look great on the table and the kids really look forward to pulling them. Math may not be the first thing you think of when it comes to Christmas, but actually many popular games, like Monopoly for example, use math. It just so happens that some of our favorite homeschooling Christmas games for kids involve numbers - and you can see lots of our favorites in our page on homeschool Christmas Math. 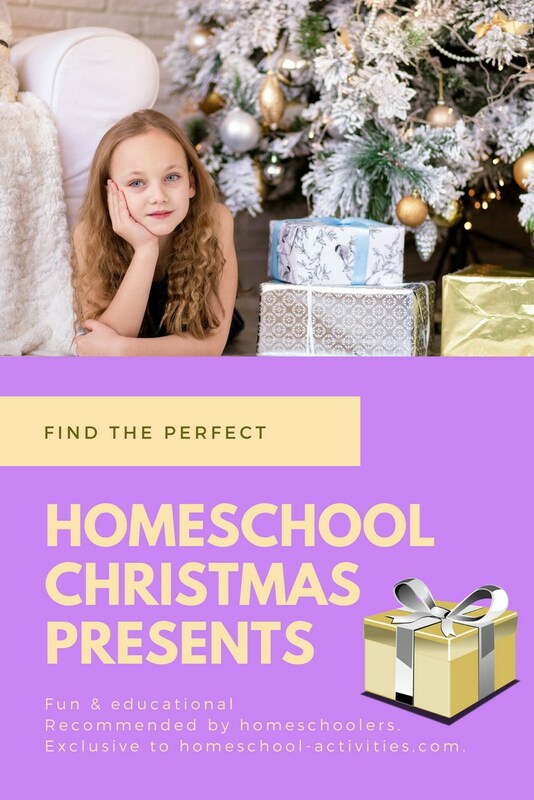 Go present shopping, bake a chocolate log, (pumpkin pie is just as good), and sing The Twelve Days of Christmas - you'll see lots more homeschool Christmas games for kids here. In a short page like this I can't possibly do justice to all the Christmas activities for kids you can choose from - my hope is that I've encouraged you to have a go yourself by giving you a small taste of Christmas. I know it can be hard sometimes to find that extra special present which will light up your Christmas by being both fun and educational. Here is a gift guide for those memorable presents. They are all presents which have come top of the list with our children William (now at Oxford University) and Catherine, or come highly recommended by over 9,000 Facebook fans.